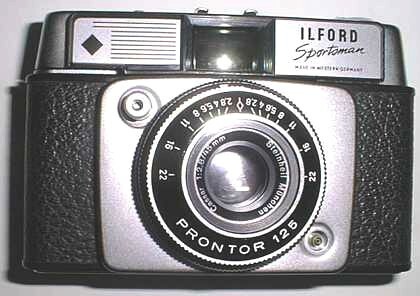 The Sportsman Prontor 125 was acknowledged by Ilford to be the UK successor to the previous Sportsman Varios and indeed, by mid-1964 it had seemingly replaced all of the lower specified Sportsman cameras; the entire UK range then consisted of the 125, the Sportsman Auto Rangefinder and the Sportsman Manumatic. The Sportsman 125 first appeared in December 1963 (Ref: Newsdesk; 35mm and sub-miniature Photography) priced at £12.17s.6d (£12.88p). It was still on sale in spring of 1965 (full page advert in Amateur Photographer dated 24th March) when it was still priced at £12.17s.6d "practically a gift" as Ilford claimed. Then again, in the 18th May 1966 issue of AP, "If you're the sort of photographer who's keen to make every shot a winner - chances are you're already using a Sportsman 125". The price was still unchanged. A pdf file of the instruction booklet is available by clicking the icon. It is dated February 1964 (B64) - presumably a reprint of the first edition. Please be patient while the 3.1MB file downloads. The lens is a f2.8 45mm Cassar from Steinheil of Munchen, focussing to 3.3ft (1m) in a Prontor 125 shutter, giving 1/30, 1/60, 1/125 and B. The shutter is X flash synchronised. The Prontor 125 shutter is of the self-cocking type i.e. it is not tensioned by the wind-on lever but by the user during the first movement of pressing the shutter release button. This seemingly required the shutter button to have a longer 'travel' than on other versions. The 'feel' of the shutter release is not as good as where all it does is to 'trip' the already tensioned shutter. With the Prontor initially only providing a 1/125th top speed, there seems no justification to replace the 1/200th Vario shutter, so it can only be presumed the change to a Prontor 125 shutter was for cost saving. The Prontor 125 shutter acquired a higher top shutter speed of 1/250th sec and also 1/300th sec before the camera was superseded by the Style 5 Sportsman 300, which had the Prontor 1/300th sec shutter - though that style camera was also available with a Prontor 125 shutter, so the exact genealogy is uncertain. The higher speed Prontor shutters were 'conventional', in the sense that they were tensioned by the film wind-on lever and the shutter release merely 'tripped' the shutter's internal locking mechanism - as distinct from the Prontor 125, where the shutter was tensioned and released through the single 'press-in' action of the shutter release button. It is possible that designing the higher speed versions to operate the same as the Prontor 125 would have led to camera shake, due to the camera jerking at the moment when the pressure on the shutter button chnaged from a tensioning action into a releasing action. The greater spring tension required to achieve the higher speeds would have made this change more pronounced. The picture above (LHS) shows a Style 4 Sportsman fitted with the Prontor 250 shutter but this version may not have been sold in the UK (no UK adverts are known). The lens is a Color-Subitar, f2.8 45mm. Also pictured above (RHS) is a version with a Prontor 300 shutter, Steinheil Cassar f2.8 lens and grey leatherette body covering, the grey covering suggesting this will almost certainly not have been sold in the UK, only in mainland Europe. This version is pictured courtesy of David Muggleton. The exposure counter is now of the self-resetting type, on the base of the camera near the rewind release button, as shown above. 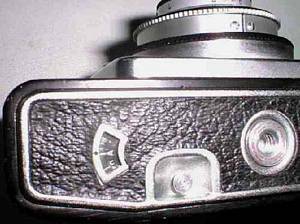 The rewind knob is now a folding rewind crank at the right hand end of the top plate, as viewed from the camera front. It is known that two types of rewind were used, one having bevelled edges to the disc into which the fold-away crank is recessed (as top left and below, left) while the the other type omits the bevel. 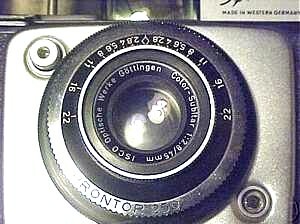 The film type reminder dial is now flush with the camera top, at the left hand end. In the example above the film reminder dial has settings for Ilford's (then) current range of monochrome films, Pan F, FP3 & HP3. 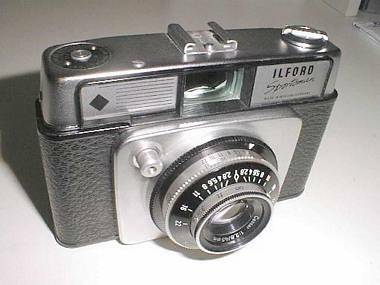 The example below, however, has its film reminder dial labelled with ASA and DIN film speeds, with no mention of Ilford's films. Possibly this arrangement was intended for selling outside the UK where Ilford's films were less accessible. This picture by courtesy of M Pekka in Finland. The March 1963 Ilford advert asks us "don't forget the Sportsman's good-looking all-action friends". The Sportsmaster Manumatic £44.7s.1d (£44.35p, same price as in May 1962), the Sportsman Auto Rangefinder £31.16s.1d (£31.80p, same price as in May 1962) and the Sportsman Rangefinder £13.13s.2d (£13.66p, much cheaper than the £18 asked in May 1962 and cheaper again than its price when first introduced, being almost £20 in February 1960). It is unclear whether the above list of just 4 cameras within the range means that the other cameras, i.e. the Auto and the Sportsmaster, have been deleted.